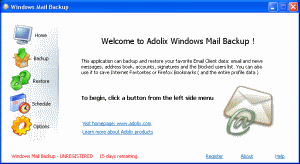 Adolix Windows Mail Backup 1.4 - Download Win Apps. Backup Windows Vista Mail. Save your emails, folders, rules and stationaries..
You can protect your emails with encryption and passwords. This tool can be used by both home based users and professionals. It only requires Windows Vista.